The Irishman has made quite the impression since joining in the summer from Burnley. Much of Inverness Caledonian Thistle's recent success has come from recruiting players from England's lower leagues and the next star in the making could be Adam Evans. Having joined the club this summer following a spell with Burnley, he has made a strong early impression in the under 20s league scoring and creating goals. A Republic of Ireland Under 19 international, Evans has had to wait for his first-team chance with Billy McKay continuing to find the net. But having helped the youngsters to top the U20s table alongside Hibernian and Rangers, Evans is tipped to get his opportunity under the guidance of John Hughes. Comfortable out wide as well as leading the attack, Evans' pace makes him a threat to defenders leading to comparisons with Celtic's James Forrest in terms of style. With some added composure in one-on-one situations, the teenager could easily make his impact in the country's top flight before the season is over. Inverness Under-20s coach Scott Kellacher: "Adam's strengths are his pace and his versatility. He has played out wide as well as up front and his speed really frightens defenders. "He has been outstanding for us since joining and he certainly hasn't looked out of place when training with the first team. "He is a brilliant character around the club. Adam and his fellow Irishman Joe Gorman are always laughing, joking or getting up to something. "He has a big future ahead of him and he really deserves an opportunity. I'm sure he will get his chance in 2014." Logan Ross said: "Adam Evans is an amazing prospect for the near future. He is a great player in the midfield where he dominates play and chips in everywhere on the pitch. 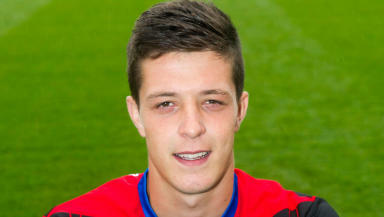 "Adam is different to a lot of players in the SPFL. I want to describe as a player capable of pulling off tricks like Gary Mackay-Steven but I've seen him do things with the ball that lead to chances being created. He has a keen eye for a pass and remains cool, calm and collected with the ball at his feet. "In one home game, he picked the ball up in the centre circle, dribbled past three County defenders before performing a Marseille Roulette to go past the last defender. "I'm extremely excited to see him on the pitch for the first team."